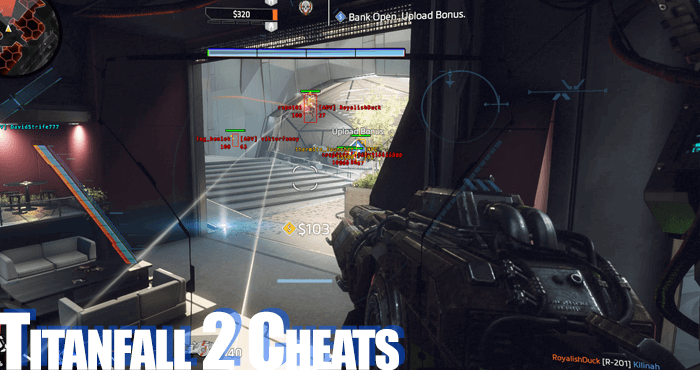 Is it possible to Cheat in Titanfall 2? Yes. 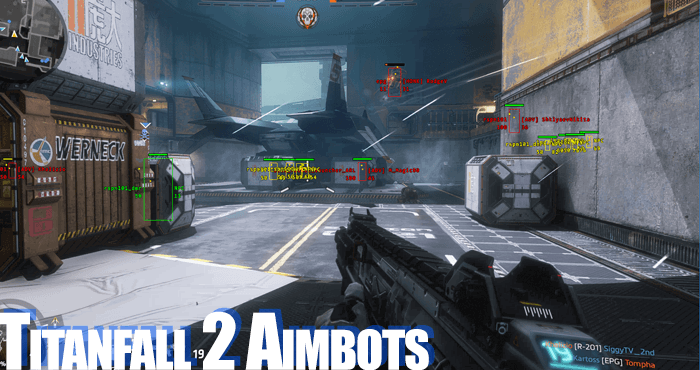 The use of software to inject code into the game, such as aimbots that automatically aim for you or wallhacks that show you enemies through walls works in Titanfall 2. There are also some minor scripts for using abilities (tacticals) automatically and advanced hacks. These programs will allow you to level up and gen up more quickly and unlock all the goodies in about one day. However, there is no way to hack your player level or gen, or to unlock all weapons, perks, mods and gear, since this is an online shooter and that information is stored on the game servers and therefore cannot be changed using any kind of program. Is it legal to cheat? Will my account get banned? Cheating in any game, including video games, pc games, playstation games and xbox games is completely legal everywhere in the world. Noone will love you for cheating, if people notice you cheating, they are likely to report you, but it is legal before the law. Worst thing that can happen is that your account gets softbanned by fairfight and you are queued with other cheaters, which is what the original Titanfall did as well. If you are buying and using quality hack software and follow best practices, you will be totally fine. 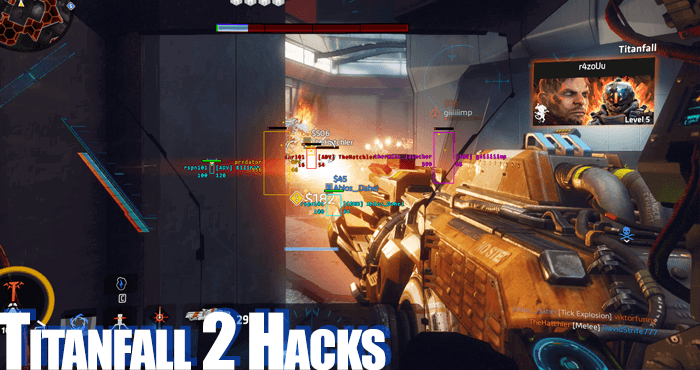 Find and Download Titanfall 2 Hacks and Aimbots today! Wallhacks and aim bots will scan the map for the location of players and either display them to you (ESP) or use the data to automatically aim for you at the push of a button/press of a key. This kind of Titanfall 2 cheat exploits the fact that in order for the game to run properly, the game has to load the whole map including all players onto your graphics processing unit. Works on both PC and consoles, but it is a lot harder to run unsigned code on a console, such as the PS4 or Xbox one. Aimbots work for both pilots and titans. Aimbots are a lot easier detected than wallhacks and are risk to use, if you do not know what you are doing. So please do your research before you buy. Titanfall 2 uses FairFight to combat cheating, a software that will record statistics on your account like your kills, deaths, score, headshots, weapon accuracy and so on to determine whether or not you are a cheater. It also takes into account reports from players when making a decision on placing you into a cheater queue forever. In order to avoid detection, use quality aimbots that allow you to throttle aiming speed, delay ect and use with caution. Keep in mind people can see your killcam. Also try to keep your accuracy rating low by hooting randomaly and dong go over 2 on average with our k/d ratio. Scripts are another way to improve performance: Scripts are essentially macro bots that will automatically press buttons in certain situations for you. They are useful for TF2 Pilot Tacticals, such as Stim, Phase Shirft, A-Wall or Holo Pilot. The main use for most people is to avoid death by activating tacticals at a certain percentage of health. So for example stim will be automatically activated if you are falling below 40% health in order to heal you back up automatically of phase shift hides you from more damage, allowing you to stay alive for longer and therefore get more score, level up quicker and unlock more stuff. Scripts usually cannot be bought, but have to either be created for yourself or gotten from active scripter communities, such as AutoHotkey or autoIT ect. This is the kind of cheat that you are more likely to see on consoles (PS4, XB1). Since the game uses peer to peer matchmaking, one of the players is essentially the game server (host) and if he is running a hacked console, can edit any data on the server, making achieving really powerful cheats possible. While this is theoretically also possible to do on PC, the main application is on consoles. The way it usually works is that people that own hacked consoles will sell their services to hacked lobby buyers and will give them anything they ask for for a certina amount of time. During that time the buyer has to stay in the modded / hacked lobby. Any hacks achieved in this way are not permanent also the chance of getting banned depends on the provider and if he is able to hide the buyers name and identity. Possible cheats in hacked lobbies: God Mode, Invisibility, Unlimited Ammo, Gen 10, All Unlocks, Unlimited Damage, Kill All, instant cool downs ect. While we never recommend aggressive cheating or annoying people, in this particular shooter is it important to keep the auto aim usage to a minimum: There is a Match Making Rank that will match you up with more skilled players, as you perform well in your matches in order to get more even games for everyone. However, for a cheater that means that if they cheat too hard, they will be matched with very experienced players that will be far more likely to notice their cheating and report them immediately, making a ban / softban a lot more likely. So for both the purposes of avoiding FairFight softbans and avoiding getting too high MMR, on top of the very obvious moral reasons, one should definitively limit ones cheating to a minimum. Riding that thin line between progressing fast and being very good. I’m banned / softbanned from Titanfall 2 – What do I do? Well first question you have to ask yourself is: Am I banned because I cheated? Also have I used public hacks that are usually detected within a few days? If you have to answer any of the above questions with yes, then all you can do is hope that you got banned by the server-side statistical analysis and ask to get unbanned at the EA support. However, if your hack code was detected, because you used some trash free hacks, then they have proof that you cheated and your account will not get out of the soft or hard ban, unless you are extremely lucky. Is it possible to rebuy the game and play if I got banned? Yes indeed you simply make another account and rebuy the game. Bans are usually against game codes / accounts and not against your IP address, since generally these days a lot of people are using common IP addresses through routers and so on. So rebuying the game and using quality hacks this time will work just fine. This may be one of the few shooters that kind of allow for bot usage to slowly but automatically level your account and getting to that juicy G10.49 without having to grind for months. Let me explain: The MMR system will automatically put “bad” players with bad players so if a few people were running some very simple bots that enter attrition matches and just randomly shot or used some simple aimbot functions, they would very soon end up at the very bottom of the MMR ladder and be put into matches with the worst players in the game and other bots. So theoretically botting is possible in TF2, but only time will tell if people actually release the programs to do so. If you want to find any farming bots for Titanfall 2 as soon as they are released, subscribe to our access program.